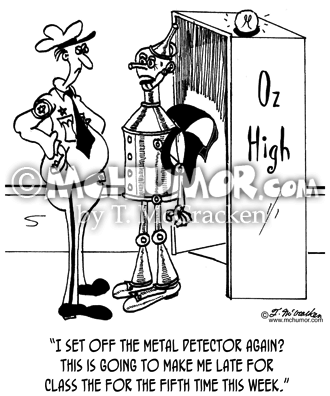 Security Cartoon 7441: The Tin Man at Oz High School saying to a security guard, "I set off the metal detector again? This is going to make me late for class the for the fifth time this week." 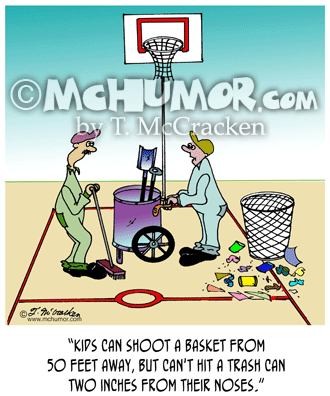 Basketball Cartoon 4443: A janitor cleaning up trash after a basketball game saying, "Kids can shoot a basket from 50 feet away, but can't hit a trash can two inches from their nose?" Education Cartoon 7319: Two teachers walk by a group of people fighting and hitting each other over the head with bouquets of flowers. 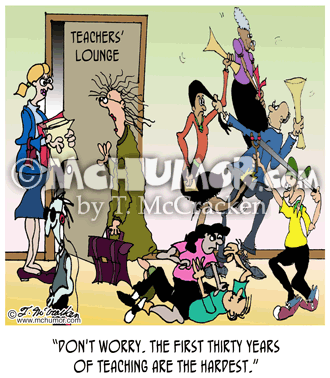 The older teacher says, "Don't worry, the first thirty years of teaching are the hardest." 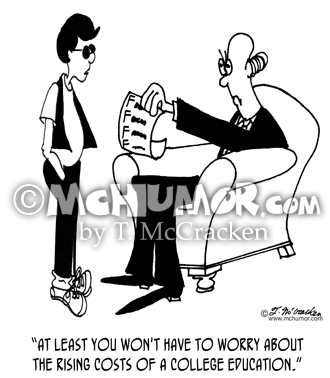 Education Cartoon 4322: A boy showing his F filled report card to his father and saying, "At least you won't have to worry about the rising costs of a college education." 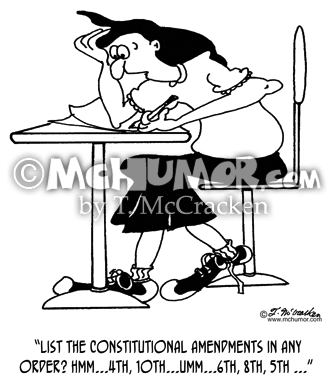 Law Cartoon 5306: A student taking a test says, "List the constitutional amendments in any order? 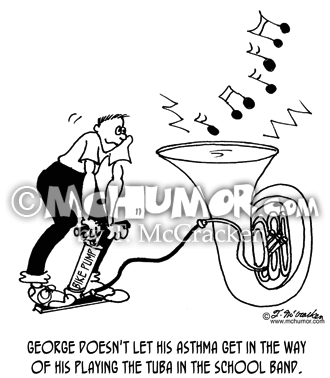 Hmmm ... 4th, 10th ... ummm ... 6th, 8th, 5th, ... "
Asthma Cartoon 6032: "George doesn't let his asthma get in the way of his playing the tuba in the school band." A kid uses a bike pump to blow into a tuba. 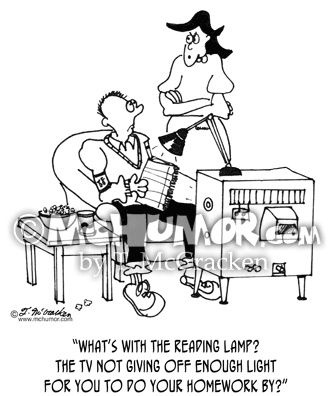 Teen Cartoon 4559: A woman says to boy reading by a TV with a reading lamp on it, "What's with the reading lamp? The TV not giving off enough light for you to do your homework by?" 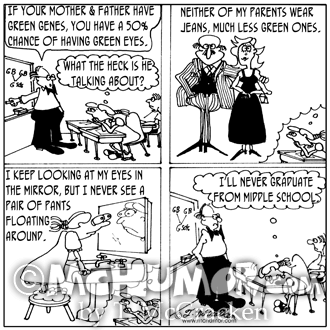 Biology Cartoon 4600: Four panels: A) A science teacher says, "If your mother and father have green genes, you have a 50% chance of having green eyes." 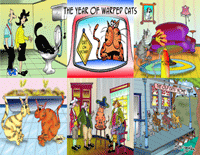 A girl thinks, "What the heck is he talking about?" B) The girl imagines her straight-laced parents and thinks, "Neither of my parents wear jeans, much less green ones." C) The girl looking in a mirror thinks, "I keep looking at my eyes in the mirror, but I never see a pair of pants floating around." D) She bangs her head on her desk and thinks, "I'll never graduate from middle school." 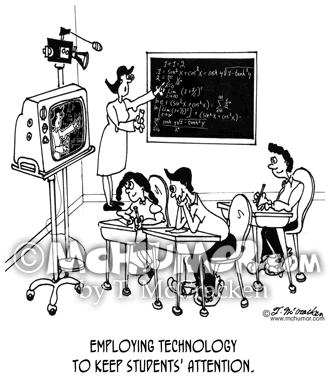 Education Cartoon 5540: In a classroom a teacher is filmed by a video camera. Students watch the TV monitor next to her instead of her. "Employing technology to keep students' attention." 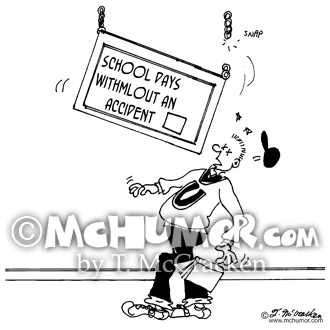 School Cartoon 7236: A sign that says "18 School Days Without an Accident," falls and hits a student on the head.